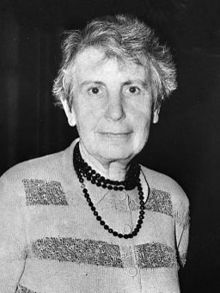 Anna Freud (3 December 1895 – 9 October 1982) was an Austrian-British psychoanalyst. She was born in Vienna, the sixth and youngest child of Sigmund Freud and Martha Bernays. She followed the path of her father and contributed to the field of psychoanalysis. Alongside Melanie Klein, she may be considered the founder of psychoanalytic child psychology. Compared to her father, her work emphasized the importance of the ego and its normal "developmental lines" as well as incorporating a distinctive emphasis on collaborative work across a range of analytical and observational contexts. 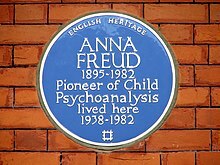 After the Freud family were forced to leave Vienna in 1938, with the advent of the Nazi regime in Austria, she resumed her psychoanalytic practice and her pioneering work in child psychology in London, establishing the Hampstead Child Therapy Course and Clinic in 1952 (now renamed the Anna Freud National Centre for Children and Families) as a centre for therapy, training and research work. As well as this rivalry between the two sisters, Anna had other difficulties growing up – 'a somewhat troubled youngster who complained to her father in candid letters how all sorts of unreasonable thoughts and feelings plagued her'. It seems that 'in general, she was relentlessly competitive with her siblings...and was repeatedly sent to health farms for thorough rest, salutary walks, and some extra pounds to fill out her all too slender shape': she may have suffered from depression which caused eating disorders. The close relationship between Anna and her father was different from the rest of her family. She was a lively child with a reputation for mischief. Freud wrote to his friend Wilhelm Fliess in 1899: "Anna has become downright beautiful through naughtiness." Freud is said to refer to her in his diaries more than others in the family. Later on Anna Freud would say that she didn't learn much in school; instead she learned from her father and his guests at home. This was how she picked up Hebrew, German, English, French and Italian. At the age of 15, she started reading her father's work and discovered a dream she had 'at the age of nineteen months ... appeared in The Interpretation of Dreams. Commentators have noted how 'in the dream of little Anna ... little Anna only hallucinates forbidden objects'. Anna finished her education at the Cottage Lyceum in Vienna in 1912. Suffering from a depression and anorexia, she was very insecure about what to do in the future. A visit to Britain in the autumn of 1914, which her father's colleague, Ernest Jones, chaperoned, became of concern to Freud when he learned of the latter's romantic intentions. His advice to Jones, in a letter of 22 July 1914, was that his daughter "... does not claim to be treated as a woman, being still far away from sexual longings and rather refusing man. There is an outspoken understanding between me and her that she should not consider marriage or the preliminaries before she gets two or three years older". In 1914 she passed the test to work as a teaching apprentice at her old school, the Cottage Lyceum. From 1915 to 1917, she worked as a teaching apprentice for third, fourth, and fifth graders. For the school year 1917-18, she began 'her first venture as Klassenlehrerin (head teacher) for the second grade'. For her performance during the school years 1915-18 she was highly praised by her superior, Salka Goldman who 'wrote ... she showed "great zeal "for all her responsibilities, but she was particularly appreciated for her "conscientious preparations" and for her "gift for teaching" ... being such a success that she was invited to stay on with a regular four-year contract starting in the fall of 1918'. After experiencing multiple episodes of illness Anna Freud resigned her teaching post in 1920. This enabled her to pursue further her growing interest in her father's work and writings. From 1918 to 1921 and from 1924 to 1929 she was in analysis with her father. In 1922 she presented her paper "Beating Fantasies and Daydreams" to the Vienna Psychoanalytical Society and became a member of the society. In 1923, she began her own psychoanalytical practice with children and by 1925 she was teaching at the Vienna Psychoanalytic Training Institute on the technique of child analysis. From 1925 until 1934, she was the Secretary of the International Psychoanalytical Association while she continued child analysis and contributed to seminars and conferences on the subject. In 1935, she became director of the Vienna Psychoanalytical Training Institute and the following year she published her influential study of the "ways and means by which the ego wards off depression, displeasure and anxiety", The Ego and the Mechanisms of Defence. It became a founding work of ego psychology and established Freud's reputation as a pioneering theoretician. Among the first children Anna Freud took into analysis were those of Dorothy Burlingham. In 1925 Burlingham, heiress to the Tiffany luxury jewellery retailer, had arrived in Vienna from New York with her four children and entered analysis firstly with Theodore Reik and then, with a view to training in child analysis, with Freud himself. Anna and Dorothy soon developed "intimate relations that closely resembled those of lesbians", though Anna "categorically denied the existence of a sexual relationship". After the Burlinghams moved into the same apartment block as the Freuds in 1929 she became, in effect, the children's stepparent. In 1938, following the Anschluss in which Nazi Germany occupied Austria, Anna was taken to Gestapo headquarters in Vienna for questioning on the activities of the International Psychoanalytical Association. Unknown to her father, she and her brother Martin had obtained Veronal from Max Schur, the family doctor, in sufficient quantities to commit suicide if faced with torture or internment. However, she survived her interrogation ordeal and returned to the family home. After her father had reluctantly accepted the urgent need to leave Vienna, she set about organising the complex immigration process for the family in liaison with Ernest Jones, the then President of the International Psychoanalytical Association, who secured the immigration permits that eventually led to the family establishing their new home in London at 20 Maresfield Gardens, Hampstead. Anna Freud's London home, now dedicated to the life and work of her father as the Freud Museum. In 1941 Freud and Burlingham collaborated in establishing the Hampstead War Nursery for children whose lives had been disrupted by the war. Premises were acquired in Hampstead, North London and in Essex to provide education and residential care with mothers encouraged to visit as often as practicable. Many for the staff were recruited from the exiled Austro-German diaspora. Lectures and seminars on psychoanalytic theory and practice were regular features of staff training. Freud and Burlingham went on to publish a series of observational studies on child development based on the work of the Nursery with a focus on the impact of stress on children and their capacity to find substitute affections among peers in the absence of their parents. The Bulldog Banks Home, run on similar lines to the Nursery, was established after the war for a group of children who had survived the concentration camps. Building on and developing their war-time work with children, Freud and Burlingham established the Hampstead Child Therapy Course and Clinic (now the Anna Freud National Centre for Children and Families) in 1952 as a centre for therapy, training and research work. During the war years the hostility between Anna Freud and Melanie Klein and their respective followers in the British Psychoanalytic Society (BPS) grew more intense. Their disagreements, which dated back to the 1920s, centered around the theory of the genesis of the super-ego and the consequent clinical approach to the pre-Oedipal child; Klein argued for play as an equivalent to free association in adult analyses. Anna Freud opposed any such equivalence, proposing an educative intervention with the child until an appropriate level of ego development was reached at the Oedipal stage. Klein held this to be a collusive inhibition of analytical work with the child. To avoid a terminal split in the BPS Ernest Jones, its President, chaired a number of "extraordinary business meetings" with the aim of defusing the conflict, and these continued during the war years. The meetings, which became known as the Controversial Discussions, were established on a more regular basis from 1942. In 1944 there finally emerged a compromise agreement which allowed the Freudians, Klienians and a group of "Independents" to access their own training and accreditation programmes. From the 1950s until the end of her life Freud travelled regularly to the United States to lecture, to teach and to visit friends. During the 1970s she was concerned with the problems of emotionally deprived and socially disadvantaged children, and she studied deviations and delays in development. At Yale Law School, she taught seminars on crime and the family: this led to a transatlantic collaboration with Joseph Goldstein and Albert J. Solnit on children's needs and the law, published in three volumes as Beyond the Best Interests of the Child (1973), Before the Best Interests of the Child (1979), and In the Best Interests of the Child (1986). Freud naturalised as a British subject on 22 July 1946. She was elected as a Foreign Honorary Member of the American Academy of Arts and Sciences in 1959 and in 1973 she was made an Honorary President of the International Psychoanalytic Association. Freud died in London on 9 October 1982. She was cremated at Golders Green Crematorium and her ashes placed in a marble shelf next to her parents' ancient Greek funeral urn. Her life-partner Dorothy Burlingham and several other members of the Freud family also rest there. In 1986 her London home of forty years was transformed, according to her wishes, into the Freud Museum, dedicated to the memory of her father. Anna Freud was a prolific writer, contributing articles on psychoanalysis to many different publications throughout her lifetime. Her first publication was titled, An Introduction to Psychoanalysis: Lectures for Child Analysts and Teachers 1922-1935, and was the result of four different lectures she was delivering at the time, to teachers and caretakers of young children in Vienna. Anna Freud's first article Beating fantasies and daydreams (1922), 'drew in part on her own inner life, but th[at] ... made her contribution no less scientific'. In it she explained how, 'Daydreaming, which consciously may be designed to suppress masturbation, is mainly unconsciously an elaboration of the original masturbatory fantasies'. Her father, Sigmund Freud, had earlier covered very similar ground in '"A Child is Being Beaten"' – 'they both used material from her analysis as clinical illustration in their sometimes complementary papers' – in which he highlighted a female case where 'an elaborate superstructure of day-dreams, which was of great significance for the life of the person concerned, had grown up over the masochistic beating-phantasy ... [one] which almost rose to the level of a work of art'. 'Her views on child development, which she expounded in 1927 in her first book, An Introduction to the Technique of Child Analysis, clashed with those of Melanie Klein ... [who] was departing from the developmental schedule that Freud, and his analyst daughter, found most plausible'. In particular, Anna Freud's belief that 'In children's analysis, the transference plays a different role ... and the analyst not only "represents mother" but is still an original second mother in the life of the child' became something of an orthodoxy over much of the psychoanalytic world. For her next major work in 1936, her 'classic monograph on ego psychology and defense mechanisms, Anna Freud drew on her own clinical experience, but relied on her father's writings as the principal and authoritative source of her theoretical insights'. Here her 'cataloguing of regression, repression, reaction formation, isolation, undoing, projection, introjection, turning against the self, reversal and sublimation' helped establish the importance of the ego functions and the concept of defence mechanisms, continuing the greater emphasis on the ego of her father – 'We should like to learn more about the ego' – during his final decades. Special attention was paid in it to later childhood and adolescent developments – 'I have always been more attracted to the latency period than the pre-Oedipal phases' – emphasising how the 'increased intellectual, scientific, and philosophical interests of this period represent attempts at mastering the drives'. The problem posed by physiological maturation has been stated forcefully by Anna Freud. "Aggressive impulses are intensified to the point of complete unruliness, hunger becomes voracity... The reaction-formations, which seemed to be firmly established in the structure of the ego, threaten to fall to pieces". Selma Fraiberg's tribute of 1959 that 'The writings of Anna Freud on ego psychology and her studies in early child development have illuminated the world of childhood for workers in the most varied professions and have been for me my introduction and most valuable guide spoke at that time for most of psychoanalysis outside the Kleinian heartland. Arguably, however, it was in Anna Freud's London years 'that she wrote her most distinguished psychoanalytic papers – including "About Losing and Being Lost", which everyone should read regardless of their interest in psychoanalysis'. Her description therein of 'simultaneous urges to remain loyal to the dead and to turn towards new ties with the living' may perhaps reflect her own mourning process after her father's recent death. 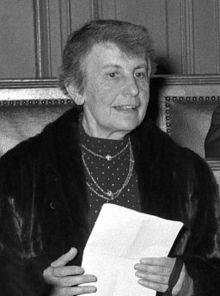 Focusing thereafter on research, observation and treatment of children, Anna Freud established a group of prominent child developmental analysts (which included Erik Erikson, Edith Jacobson and Margaret Mahler) who noticed that children's symptoms were ultimately analogue to personality disorders among adults and thus often related to developmental stages. Her book Normality and Pathology in Childhood (1965) summarised 'the use of developmental lines charting theoretical normal growth "from dependency to emotional self-reliance"'. Through these then revolutionary ideas Anna provided us with a comprehensive developmental theory and the concept of developmental lines, which combined her father's important drive model with more recent object relations theories emphasizing the importance of parents in child development processes. Nevertheless, her basic loyalty to her father's work remained unimpaired, and it might indeed be said that 'she devoted her life to protecting her father's legacy ... In her theoretical work there would be little criticism of him, and she would make what is still the finest contribution to the psychoanalytic understanding of passivity', or what she termed 'altruistic surrender ... excessive concern and anxiety for the lives of his love objects'. With psychoanalysis continuing to move away from classical Freudianism to other concerns, it may still be salutary to heed Anna Freud's warning about the potential loss of her father's 'emphasis on conflict within the individual person, the aims, ideas and ideals battling with the drives to keep the individual within a civilized community. It has become modern to water this down to every individual's longing for perfect unity with his mother ... There is an enormous amount that gets lost this way'. You asked me what I consider essential personal qualities in a future psychoanalyst. The answer is comparatively simple. If you want to be a real psychoanalyst you have to have a great love of the truth, scientific truth as well as personal truth, and you have to place this appreciation of truth higher than any discomfort at meeting unpleasant facts, whether they belong to the world outside or to your own inner person. Further, I think that a psychoanalyst should have... interests... beyond the limits of the medical field... in facts that belong to sociology, religion, literature, [and] history,... [otherwise] his outlook on... his patient will remain too narrow. This point contains... the necessary preparations beyond the requirements made on candidates of psychoanalysis in the institutes. You ought to be a great reader and become acquainted with the literature of many countries and cultures. In the great literary figures you will find people who know at least as much of human nature as the psychiatrists and psychologists try to do. In perhaps not dissimilar vein, she wrote in 1954 that 'With due respect for the necessary strictest handling and interpretation of the transference, I feel still that we should leave room somewhere for the realization that analyst and patient are also two real people, of equal adult status, in a real personal relationship to each other'. Freud in collaboration with Sophie Dann: "An Experiment in Group Upbringing", in: The Psychoanalytic Study of the Child, VI, 1951. In 2002, Freud was honoured with a blue plaque, by English Heritage, at 20 Maresfield Gardens, Hampstead in London, her home between 1938 and 1982. On 3 December 2014, Freud was the subject of a Google Doodle. The final track on the 2001 eponymous debut album of indie-rock band The National is titled "Anna Freud". The novel Hysterical: Anna Freud's Story, by Rebecca Coffey was published by She Writes Press in 2014. ^ "Anna Freud | Austrian-British psychoanalyst". Encyclopædia Britannica. Retrieved 26 April 2016. ^ Shapiro, Michael (2000). The Jewish 100: A Ranking of the Most Influential Jews of All Time. p. 276. ^ "Anna Freud, Psychoanalyst, Dies in London at 86" www.nytimes.com. Retrieved 2016-04-26. ^ chapitre X, second part named "L'antigone vierge et martyre" de Michel Onfray, in "Le crépuscule d'une idole. L'affabulation freudienne." Grasset, Paris, 2010. ^ Paskauskas, R. Andrew (Editor). The Complete Correspondence of Sigmund Freud and Ernest Jones, 1908-1939. Cambridge, Massachusetts/London: Belknap Press 1993. ^ a b Young-Bruehl, Elisabeth (2008). Anna Freud: A Biography. Yale University Press. pp. 76–78. ISBN 978-0300140231. ^ "No. 37734". The London Gazette. 20 September 1946. p. 4754. ^ "Book of Members, 1780–2010: Chapter F" (PDF). American Academy of Arts and Sciences. Retrieved 29 July 2014. ^ Eric T. Pengelley, Daphne M. Pengelley. A Traveler's Guide to the History of Biology and Medicine. Davis, Calif.: Trevor Hill Press, 1986, p. 86. ^ a b "THE WRITINGS OF ANNA FREUD" (PDF). International Universities Press Inc.
^ Aldridge, Jerry (2 July 2014). "Beyond Psychoanalysis: The Contributions of Anna Freud to Applied Developmental Psychology" (PDF). SOP TRANSACTIONS ON PSYCHOLOGY. 1: 25. ISSN 2373-8634. Archived from the original (PDF) on 28 June 2014. ^ From a letter written by Anna Freud in. Kohut, Heinz (1968). "Heinz Kohut: The evaluation of applicants for psychoanalytic training". The International Journal of Psycho-Analysis And Bulletin of the International Psycho-Analytical Association. 49: 548–554 (552–553). ^ The Psychoanalytic Study of the Child Series, Yale University Press. ^ "Anna Freud: This is why child psychoanalyst and daughter of Sigmund Freud has been given Google doodle". The Independent. Retrieved 3 December 2014. ^ "The National - The National - Songs, Reviews, Credits - AllMusic". AllMusic. Retrieved 8 October 2018. ^ "'Hysterical: Anna Freud's Story' by Rebecca Coffey". 13 April 2014. Retrieved 8 October 2018. ^ "Hysterical: Anna Freud's Story". Retrieved 8 October 2018. Edmundson, M. (2007). "Freud and Anna". The Chronicle of Higher Education, 54(4). 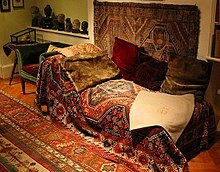 The Freud Museum. (n.d.). Retrieved February 17, 2015. Fisher, C., & Lerner, R. (2005). Encyclopedia of Applied Developmental Science (Vol. 2, p. 1360). Thousands Oaks, California: Sage Publications. Fenichel, Otto (1946). The Psychoanalytic Theory of Neurosis. London. ISBN 0203981588. Gay, Peter (1988). Freud: A Life for Our Time. London: J. M. Dent & Sons. ISBN 0-333-48638-2. Phillips, Adam (1994). On Flirtation. London: Harvard University Press. ISBN 0674634403. Young-Bruehl, Elisabeth (2008). Anna Freud: A Biography. London: Yale University Press. ISBN 978-0-300-14023-1. Coles, Robert (1992). Anna Freud: The Dream of Psychoanalysis. Reading, Mass. : Addison-Wesley. ISBN 0-201-57707-0. Peters, Uwe Henrik (1985). Anna Freud: A Life Dedicated to Children. New York: Schocken Books. ISBN 0-8052-3910-3. Coffey, Rebecca (2014). Hysterical: Anna Freud's Story. New York: She Writes Press. ISBN 9781938314421. Burlingham, Michael John (1989). Last Tiffany: A Biography of Dorothy Tiffany Burlingham. New York: Atheneum. ISBN 978-0689118708. Edgcumbe, Rose (2000). Anna Freud: a view of development, disturbance and therapeutic techniques. London: Routledge. ISBN 978-0415101998. 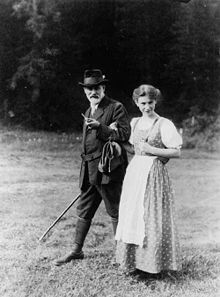 Wikimedia Commons has media related to Anna Freud. This page was last edited on 4 April 2019, at 19:24 (UTC).